The US Defense Advanced Research Projects Agency (DARPA) and General Atomics Aeronautical Systems (GA-AS) are developing the HELLADS weapon system. The USAF aims to mount the HELLADS weapon system on its bombers and unmanned aerial vehicles. The ground-based Tactical High Energy Laser (THEL) weapon system being developed for the US Army. The HELLADS programme involves development of a 150kW laser weapon system to counter ground threats such as RAM and surface-to-air missiles. The High Energy Liquid Laser Area Defense System (HELLADS) is a US defence programme to develop a high-energy laser-based weapon system to defend against surface-to-air threats. The programme aims to develop a 150kW laser system to counter ground threats such as rockets, artillery and mortar (RAM), and surface-to-air missile attacks. The high-power lasers are expected to counter multiple threats as the beams can travel at the speed of light. The HELLAD system will be first tested and demonstrated on static ground installations, before later integration onto the tactical aircraft of the US Air Force (USAF). 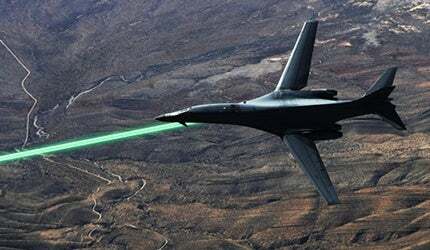 The USAF aims to arm its unmanned aerial vehicles (UAVs) and bombers such as the B-1B with the HELLADS lasers. The weapon system can also be mounted on armoured combat vehicles, surveillance aircraft and patrol ships. Precise targeting by lasers is expected to reduce collateral damages. The first prototype of the HELLADS is expected to be ready by the end of 2012. It will be tested at the White Sands Missile Range in early 2013, where the system’s air-to-ground offensive missions will also be simulated. "The system will be ten times lighter in comparison to other similar high-power laser systems." HELLADS is a diode-pumped, liquid-cooled solid-state laser weaponry system. The system will be ten times lighter and compact in comparison to other similar high-power laser systems. The order of magnitude will facilitate integration of the system with aircraft, ground vehicles and UAVs. It is expected to have a maximum weight of 750kg and volume of two to three cubic metres. The system is being developed with a power to weight ratio of about 5kg/kW. The B-1B Lancer was developed by Rockwell International, now Boeing Defense And Space Group, and is the US Air Force’s long-range strategic bomber. The US Defense Advanced Research Projects Agency (DARPA) launched the HELLADS development programme in 2001. The agency has allocated about $75m towards the development, with the programme to be completed in five phases. The initial two stages, which were completed by 2002, found the liquid laser system to be feasible. The third phase of development was completed in 2011. It involved successful testing of the laboratory scale laser module which replicates the same operational capability and geometry of the final weapon system. In February 2011, DARPA reported to have developed two module laboratory cells that exceeded 34kW output. The small size of the single laser module was made possible with lightweight metallic structures, optics, electronics and advanced cooling systems. These modules will be further developed and interconnected to produce the targeted 150kW laser output. The fourth phase will involve development of a ground-based Demonstrator Laser Weapon System (DLWS) for the programme. The final phase will involve fabrication, engineering, integration and demonstration of the HELLADS on a tactical platform. Integration of the system onto aircraft will significantly increase the efficiency of the weapon. The ground-based chemical laser systems will have target engagement and range limitations due to line of sight. The HELLADS is based on Airborne Laser (ABL) weapon system technology which incorporates a megawatt-class chemical oxygen iodine laser (COIL). The design combines efficient removal of heat from flowing liquids and high storage density. "The ground-based chemical laser systems will have target engagement and range limitations due to line of sight." The HELLADS system will have an active mirror in the blaster and a sensor for correction of the beam wave front. The cooling technique will be unique, with the liquid having the same angle of refraction as that of the mirrors to allow continuous firing. The individual laser modules will be integrated and installed with a subsystem to control the output beam and produce the final output of 150kW. The US and Israel have co-produced a fixed-site Tactical High Energy Laser (THEL) demonstrator weapon system called Skyguard, which is based on a deuterium fluoride chemical laser (DFCL). It was developed by Northrop Grumman in 2000. THEL is currently in the testing and demonstration phase. DARPA’s Strategic Technology Office is managing the HELLADS programme. General Atomics’ Aeronautical Systems (GA-AS) division is the main contractor for the development of the laser weapon system. Lockheed Martin was subcontracted for providing the system integration services in May 2005 and will be responsible for beam and fire control, target acquisition, tracking and integration of the entire subsystems on the tactical vehicle. Summit Engineering Group (SEG) is providing systems engineering, cost risk assessment and source selection support for the HELLADS programme. In December 2008, DARPA awarded a $21m contract to Textron Defense Systems to develop the unit cell as an alternative for the General Atomics laser weapon system. In 2010, Textron announced that it had developed the laser system capable of producing 100kW power output in laboratories. Its design was based on ThinZag ceramic diode-pumped solid-state laser technology. In June 2011, however, General Atomics was awarded a $39.8m contract to continue the HELLADS development and produce the system. The company will also provide the laser, thermal management, battery and control systems. Another $10.1m contract was awarded to GA-AS to provide post delivery services for DLWS, in August 2011. This project forms part of our recent analysis and forecasts of the global Missiles & Missile Defence Systems market available from our business information platform Strategic Defence Intelligence. For more information click here or contact us: EMEA: +44 20 7936 6783; Americas: +1 415 439 4914; Asia Pacific: +61 2 9947 9709 or via email.